Mention “orange” and you instantly conjure up a host of associations—brilliant colors, a fresh, clean scent and a juicy explosion of tart, sweet, tangy flavors. Oranges originating in Asia centuries ago, slowly made their way across continents and oceans to Europe and the Americas. The Vedas (composed between 1,400 and 800 B.C.E.) refer to citrons and lemons; in Chinese literature 27 varieties of the fruit are mentioned in a book of tributes to Emperor Ta Yu (2205-2197 B.C.E.) by Han Yen Chih in 1178 C.E; Theophrastus (ca. 372-287 B.C.) describes them in his accounts. More recently a Mr. Columbus brought seeds to the New World from his older one. While the citron is thought to have originated in northern India and spread to China, the sweet orange is believed to begun in southern China, entering India later on. Three citrus species are considered the source of “hybridization events” (naturally-occurring fertile cross-pollination), resulting in a great many varieties and causing endless complexity and confusion in citrus taxonomy and nomenclature. 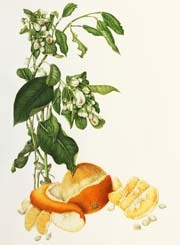 The word “orange” can be traced from the Sanskrit naranga, Persian narang, Arabic naranj, to European auranja, arangia, aurantia, naranz, naranja, laranja, orenge. There is a great deal in a name, Mr. Shakespeare! One of the oldest fruit trees to be domesticated, it has the unusual trait of displaying both mature golden orbs as well as its small fragrant white flowers simultaneously. The fruit is a modified berry (hesperidium) with a tough, leathery rind around a segmented interior (carpels) which contain juice-laden vesicles. The pigmented outer layer of rind (flavedo) contains volatile essential oils. Finely grated peel is known as zest in culinary parlance. The white fibrous layer of the inner rind (pith or albedo) is usually discarded, except in the case of citron. The color of citrus fruits develops best in subtropical climates with cool winters; in warmer regions the fruit remain the tropical “green orange”. From orange-blossom honey to bridal bouquets, perfumes, scented oils, soaps, insect repellents, furniture polish; from orange sticks for manicure to culinary delights, liquers, juices, and vitamin C to cure scurvy—citrus trees have a very long history of befriending our species. They may very well have been the immortality-giving golden apples of the sun from Hera’s orchard, guarded by three nymphs, and known in Greek mythology as the Garden of the Hesperides.